A few months ago I was lucky enough to meet up with Kristy Scrymgeour who is the owner and manager of the women’s pro team Specialized-lululemon. Kristy was in Sydney enjoying her annual pilgrimage to her parents’ beachside home. I originally wrote this article for a UK website which they published but buried a bit in another article so I thought I’d share it again…………. Kristy Scrymgeour, despite living in Europe and the US for many years is still very much an Aussie girl at heart. She’s humble, and despite being fairly softly-spoken she gets fired up when she talks about her involvement in women’s cycling. Like most Aussie kids she rode a bike as a child around her home in Sydney’s southern suburbs, but didn’t think of cycling as a serious sport until she reached university. Her opportunity came when the University cycling team was looking for an extra team member to race at the University Games and she rather bullishly put her hand up. She was studying science teaching at the University of Sydney and had only recently started cycling, after her boyfriend at the time gave her a second hand bike to ride. The love affair with the bike grew from there. She took out a loan to buy a road bike and discovered she really loved racing. She went on to finish her degree but her studies suffered after that first Uni games appearance. In 1996 after finishing Uni she was working part-time and training the rest of it, and managed a win in the National Crit Championships. The following year she headed to Europe and joined a small Dutch team. For the next few years she rode with the Australian national team basing herself in Germany and Italy and living off prize money. That was followed by a short stint in the US. After six years of professional racing Kristy decided it was time to ‘get a real job’ and was planning to return home to Australia when she landed a job with online news site, Cycling News. That continued for four years which included writing and ad sales giving her a great grounding in journalism and business. By that time she was now convinced that her involvement in cycling could form the basis of a career so she approached the owner of Highroad Sports Bob Stapleton and found herself in the role of team manager for the women’s Highroad team. That role led to the more high profile job of Marketing and Communication Director for both the men’s and women’s HTC Highroad teams. When the team folded at the end of 2011, Kristy found herself again re-evaluating her career direction. The timing was quite good for her because she was ready to move on to other things and the team’s demise gave her that push. Interestingly it was the female team members who wanted to continue racing together and approached Kristy for help to form a women’s only team. They all agreed that it would have to happen quickly so that the women wouldn’t miss out on opportunities with other teams if it didn’t work, so they gave themselves an ambitious deadline of only two weeks. Kristy approached bike company Specialized because she had an existing relationship with them through HTC Highroad. They agreed almost immediately and suggested she also approach activewear company lululemon. lululemon also agreed really quickly and the base was set – Specialized-lululemon was formed. She also managed to attract a group of other minor sponsors to the team. Plus some of the support staff from HTC Highroad also joined the team. For Kristy the team is a great opportunity for her to inject some of her own ideas but she’s also keen to create a collaborative atmosphere and regularly asks the team members for their ideas. Canadian Clara Hughes who is now a former member of team, contributed many ideas including involvement with a charity called Right to Play. In selecting team members Kristy says that when looking for new riders, she and other selectors look for riders who will give 100 per cent for their team. There’s no room for prima donnas. 2014 will be a big year for women’s cycling according to Kristy because the UCI will have a focus on getting women’s races on TV which will make a big difference to attracting sponsors who will have a guaranteed return on investment. 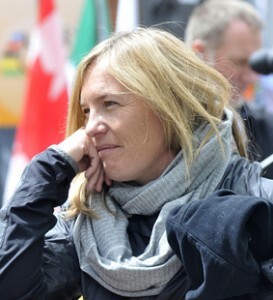 She sees the appointment of fellow Australian Tracey Gaudry’s to the UCI as an important step. Kristy does admit that it’s hard to make a living from women’s cycling and to that end is involved in two new business ventures. The first is the recent launch of a women’s cycling apparel business called Velocio with a business partner (I’ve got a few items on order and plan to write a review in the near future). The second is an energy bar called Ally’s Bar which is the brainchild of Specialized-lululemon team member Ally Starker and is all natural and organic. Kristy sees the development of women’s cycling as a fun challenge that she’s pleased to be a part of. She is passionate about women’s cycling because she’s seen how it can change women’s lives. Great read Nicola. Don’t discount the great job you, and people like you, do to promote women’s cycling. It all adds up.